Josera launch Mini range for small dogs. Leading German pet food company Josera has researched the needs of mini canine fusspots and has developed the Mini range which is designed to be irresistible to even the hardest to please little hound. Small dogs can be fussy about food. Almost every owner of a small breed knows the sniff and walk away scenario. It is stressful for the owner – and ultimately not good for the dog. The Josera Mini range has products for all life stages to suit dogs from puppy to senior citizen. The small size kibble is easy for little mouths to manage and the food helps to prevent the build-up of tooth tartar from day one. Fatty acids help to establish a glossy coat and healthy skin while duck, salmon and natural herbs create irresistible flavour. Cereal can cause itching and allergies in some dogs – but is an ingredient in many pet foods. MiniDeluxe is a tasty cereal-free mix of lamb, vegetables such as sweet potato, herbs and fruits. For senior citizens, Josera offers grain-free MiniVita which has a carefully measured mineral content to protect the kidneys, liver and other internal organs. 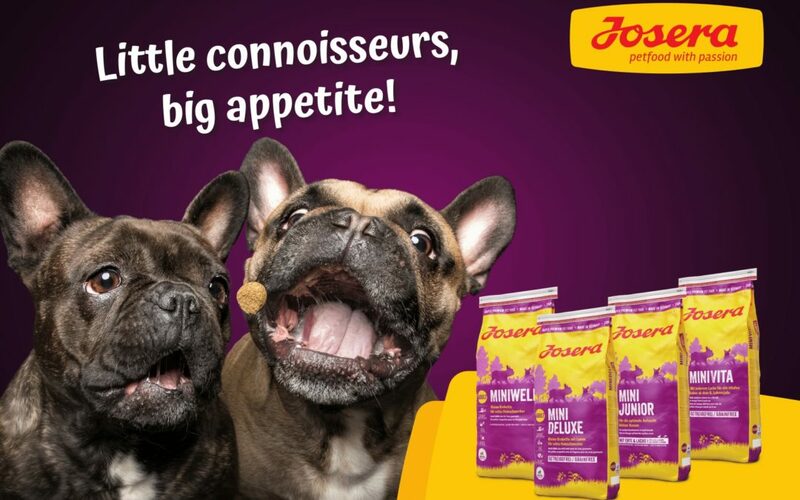 As with all Josera recipes, the Mini range foods are very nutrient-dense ensuring daily feed rations are very low and extremely well digested and assimilated thus reducing the quantity and improving the consistency of the poos. “The most popular pet owned in the United Kingdom is the dog, with 26 per cent of people owning one, “says Simon Freear. In total, 45 per cent of the UK population owns a pet. Caption: Josera promotion for Mini – small dog recipe.